The Universal Council with support of the Keshe Foundation agriculture team is proud to announce a new developmental milestone in the world of agriculture. 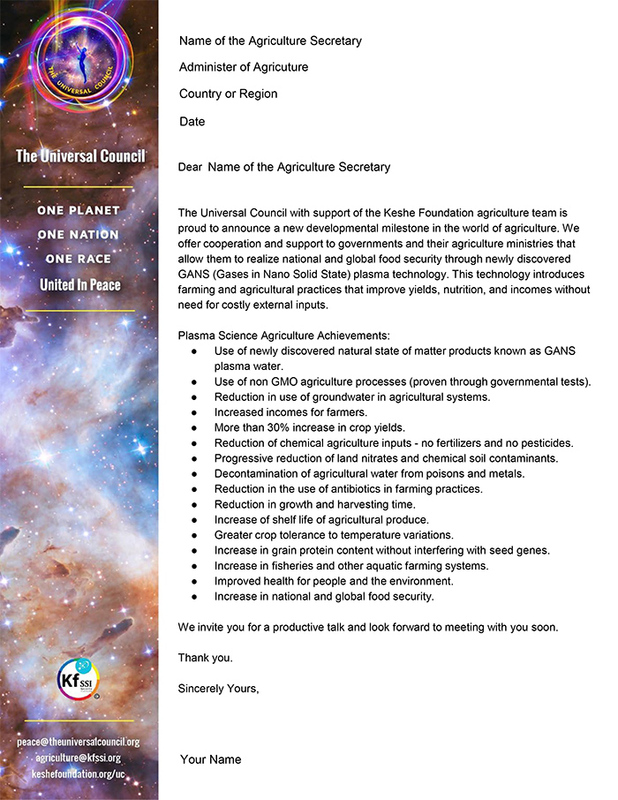 We offer cooperation and support to governments and their agriculture ministries that allow them to realize national and global food security through newly discovered GANS (Gases in Nano Solid State) plasma technology. This technology introduces farming and agricultural practices that improve yields, nutrition, and incomes without need for costly external inputs. ● Use of newly discovered natural state of matter products known as GANSplasma water. ● Use of non GMO agriculture processes (proven through governmental tests). ● Reduction in use of groundwater in agricultural systems. ● Increased incomes for farmers. ● More than 30% increase in crop yields. ● Reduction of chemical agriculture inputs -no fertilizers and no pesticides. ● Progressive reduction of land nitrates and chemical soil contaminants. ● Decontamination of agricultural water from poisons and metals. ● Reduction in the use of antibiotics in farming practices. ● Reduction in growth and harvesting time. ● Increase of shelf life of agricultural produce. ● Greater crop tolerance to temperature variations. ● Increase in grain protein content without interfering with seed genes. ● Increase in fisheries and other aquatic farming systems. ● Improved health for people and the environment. ● Increase in national and global food security. We invite you for a productive talk and look forward to meeting with you soon. As the Universal Council, through our wish in establishing World Peace, we invite you to discover the new Plasma Science. The first rule of to be members of the universal council is that : The universal council member should shine like the light of the creator, to be the source of light for other souls and radiate the light of the beauty of the creator and have and try to reach all attributes of The SOUL of the creator. In time creatures of the universe see this light and not the physicality of the man. The attributes of the creator has been stated in many scriptures of the man in the past. Secondly you are through your soul a member of the council. The members of the council can't announce themselves as a member of the council unless it is announced and registered under the council’s panels and no members of the council can ever speak as themselves being a member and influencing their opinion or words, at this point immediately they lose their seat in the council and a new member can stand for the position. Those who try to show that they are better servants of humanity they do not stand a chance to take a seat in the council. Selection of the soul of the council comes from service through giving from the soul and not by talk or physical actions. Here is the list of languages that have representatives in the Universal Council, the list will be updated as more languages have selected representatives in the Council. If you have an inner calling to serve humanity and want to join us to represent a nation in the council, you can become a member of the council for the languages that do not currently have a representative. Make sure to check our Event Schedule and participate in the next event.